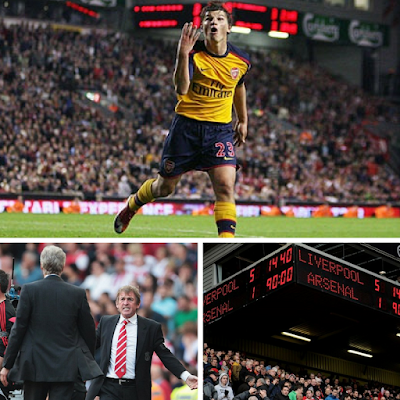 Arsene Wenger has been at Arsenal for 20 years... That's a bloody long time in football and during that time it's fair to say we've had several scrapes with the Gunners so in the run up to our opening league fixture on Sunday I thought it would be good to take a look back through the Wenger years. In the time that Arsene has been in London, Liverpool have had a total of seven managers; Roy Evans, Gerard Houllier, Rafael Benitez, Roy Hodgson, Kenny Dalglish, Brendan Rodgers and of course Jurgen Klopp. As far as I am aware, Kenny Dalglish is the only one to have voiceiferously told the Frenchman to "piss off" on the touchline. Good old Kenny. In the early days under Roy Evans (including his stint with Houllier) Liverpool picked up some strong results against Arsenal namely in the League Cup when they beat Wenger's side 4-2 in the round of 16 thanks to goals from McManaman, Fowler and Berger. Can Liverpool Shoot Down Gunners? How punditry can change within the space of... A month? December was a pretty shoddy month for Liverpool, heads were hanging, confidence was low, we'd been knocked out the Champions League, beaten by Portsmouth and beaten by Arsenal. With things beginning to hit a new low it was Arsenal who were on form winning 5 out of their 6 Premier League fixtures that month. Now were into February though it appears the tides have turned. Arsenal are now showing the poor results including a draw with Everton (pah! ), loss to Stoke and they have failed to beat either of their big rivals in Chelsea and Manchester United. Even looking at our own season we can still say we have beaten United, beaten Stoke and also got a draw. Not to mention our double over the bluenoses, yet it's Arsenal who's decline continued to be ignored, pundits remained confident that they would still find themselves in a title race despite all the warning signs.